Paper is a hard item to obtain but is worthwhile for some of the awesome recipes it is used in. Here is a tutorial on how to make paper in Minecraft. To read more about the item, you can go to its page here. Using a crafting recipe is another way of obtaining paper in Minecraft. The player will first need to start off by making a crafting table. 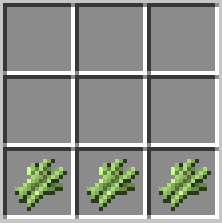 Each player starts off with a 2×2 crafting grid located in their inventory however this recipe is much more complicated and requires a 3×3 grid. This is done by opening your inventory box (Pressing ‘E’) and placing 4 wooden planks into the 2×2 grid located in the top right corner. You are able to use any type of Wooden Planks like oak, spruce, birch, jungle, acacia, or dark oak. In the example below we are using oak wooden planks. After you have completed the recipe you will need to equip the table to your hand. This is done by dragging the item to the bottom left row of your inventory box. The last step is to place the item on the ground. To do this you will need to find an open area you will like the table placed at then right click to put it on the ground. Doing this will allow you to then click on the crafting table and utilize a 3×3 grid for crafting recipes rather than the default 2×2 from your inventory. Now that you have a crafting table to use lets craft paper. 3 Sugar Cane– These can be obtained by searching the edge of waters like lakes and oceans. Tip: The sugar cane ingredient for paper is not the easiest thing to find naturally. Once you have found some it is useful to grow a sugar cane farm for yourself. You will need to put all three pieces of paper on the same row in the grid. Once this is done you will see the paper item appear in the empty box to the right. Right click on the paper to transfer the item into your inventory. You will notice that this recipe produces not just one piece of paper but rather three. Now that you have learned how to make Paper in Minecraft, it can be used as a recipe to make plenty of other items. These items are Maps, Books, and Fireworks.